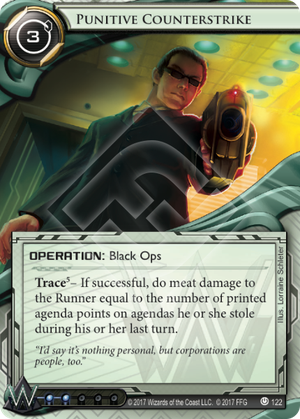 Trace – If successful, do meat damage to the Runner equal to the number of printed agenda points on agendas he or she stole during his or her last turn. SEA Source (2 inf each). Mideason Replacements (4 inf each). Smaller agendas and or/agendas that support the Scorch. Mostly big agendas (and Government Takeover if you have balls of steel). That's really it, although Archived Memories and some other cards are nice to help support the multiple Punitive combo. But, there you have it: Punitive Counterstrike needs itself and Agendas to work. In Weyland, it doesn't need as much influence. Outside of Weyland, it's less of a hit than Scorched. The deckspace and influence you save over the Scorched combos can be saved for other surprises. Doesn't need tags to work. Can potentially punish multi access like no other card without multiple copies. Playing with it frees up deck space when compared to Scorched. The Combo is cheaper to pull off. Only Plascrete and Riches can protect the runner from your eventual wrath. Is even more vulnerable to Plascrete Carapace. It goes away in the late game, as the runner gets closer to winning by setting it up. You need to include mostly 3 pointers, which limits your agenda options.